Content Submission Deadline Approaching for Fall Issue of The 66 News! 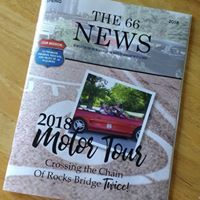 Attention Association members: August 15 is the deadline for you to submit your content to be considered for publication in the Fall 2018 issue of our members-only quarterly newsletter, The 66 News! Please put Route 66″ in the subject line. Listen to Association member, Route 66 expert and author, John Weiss, describe the allure of the Mother Road. What makes Route 66 a treasure worth preserving? John explains it all. Order your Waldmire-designed T-shirt and Funk’s Grove Midpoint Pin!